I’ve caught a lot of colds lately. As a result, I feel tired, sometimes unwell, and there are days where most of my knitting projects feel too much, too complicated, too demanding. So I’ve taken to knitting simple mitered squares out of yarn scraps. 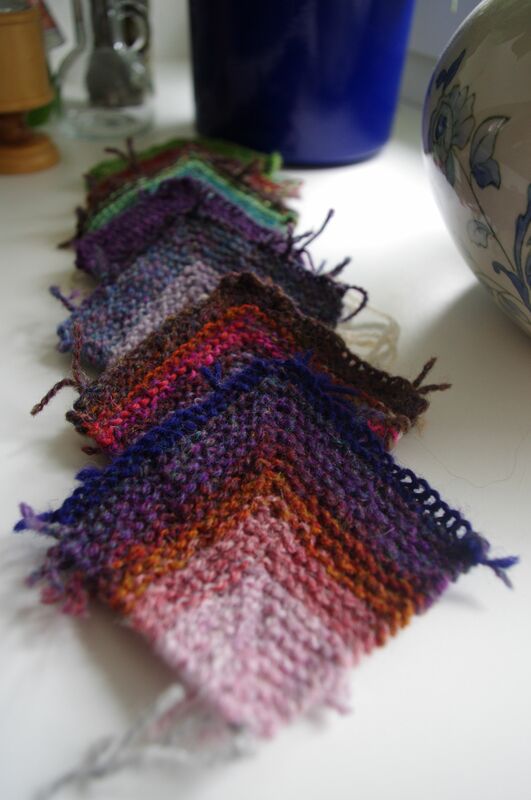 Just squares, in garter stitch, with colours going from darker to lighter shades. They feel good. As I make them on tired days, I simply tie the scraps together with a knot. It doesn’t’ look great on the wrong side, but I’ve decided I didn’t care. 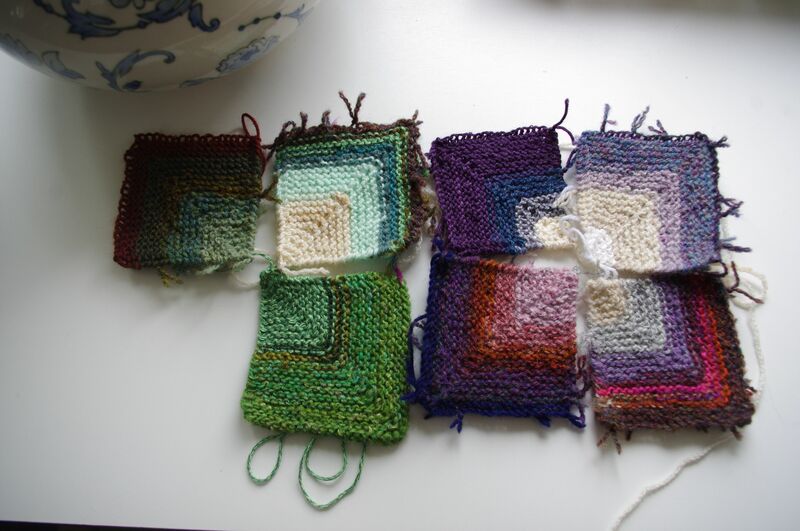 The plan is to sew the squares into bigger squares of similar colours, then to sew the bigger squares into a blanket. I’ve got seven squares so far. I’m still far, far away from a complete blanket. At this rate, this will probably take me a few years to complete. But at least, I have something to help me feel better on slower days. Garter stitch feels good, squares feel good, sorting through the scraps to pick matching colours feels good. 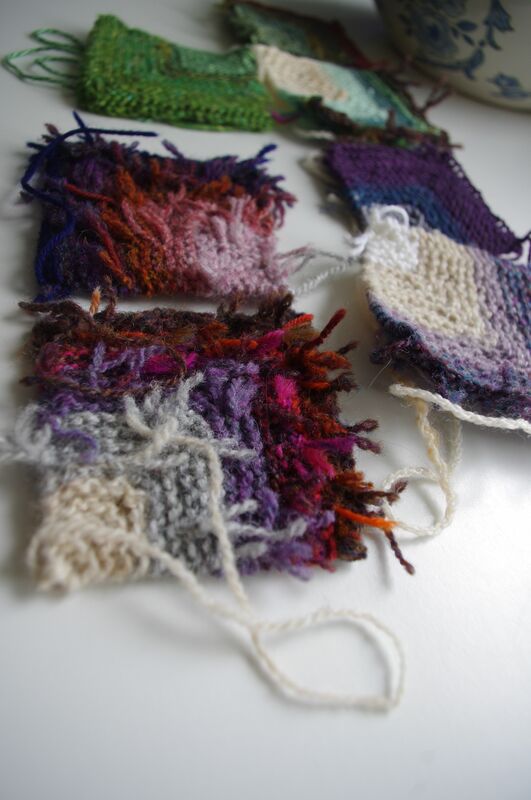 I like too that each square is like a little memory of what I’ve knitted in the past. As I add yarn scraps, I remember a sweater, a shawl, a cowl, a baby blanket, a hat, a pair of socks, things I loved knitting. It feels good. In other news, today is the International Memorial Day for “comfort women“. Have a thought or prayer for them. There are a little less survivors with each passing year, and they need us to remember them so that such atrocities never happen again. If you feel so moved, you can also support the UN action against sexual violence in conflicts. This entry was posted in Knitting and tagged Korea, life by Julie Paik. Bookmark the permalink.